If you need help scheduling a pickup, please call us at 704-786-4000. 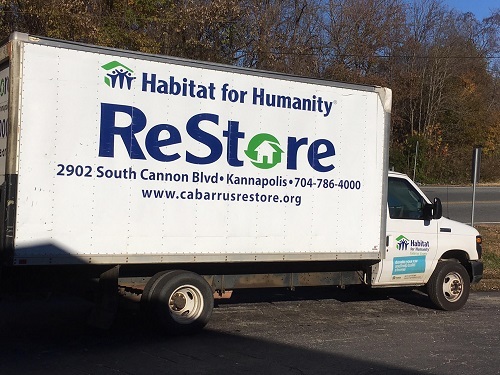 Thank you for choosing Habitat for Humanity Cabarrus County to donate your items! We offer a free pick up service for residents living in our service area and for items that you cannot transport yourself. .
Is the address for pickup located in Cabarrus County? Is the total value of the items to be picked up at least $150? I understand that the drivers will only pick up items from the first floor and will not go upstairs to pick up items. We can only pick up large items that won't fit into a pickup truck or SUV. Other items can be dropped off at our store. If you do not see your category, please call in to 704-786-4000 to discuss. Acceptance of any item is subject to driver's discretion. AM indicates a pickup time between 10:00AM and noon. PM indicates a pickup time between 1:00PM and 5:00PM. You will receive a confirmation e-mail within an hour. If you need to cancel your pickup, please call 704-786-4000. Our drivers will only pick up items on the first floor and do not go upstairs to pick up items. Click here to return to the Habitat for Humanity Cabarrus County home page.